Was the Cover-Up Part of the JFK Assassination Plot? 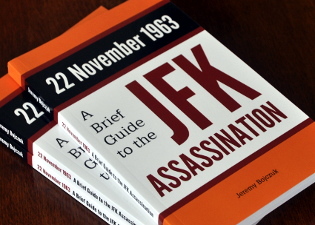 You are here: Home › Further Reading › JFK Assassination FAQs › Was the Cover–Up Part of the Plot? Official reaction to the assassination was motivated primarily by the need to contain public dissatisfaction with established institutions, and was prompted by Oswald's apparent links to the Soviet and Cuban regimes and to US intelligence organisations. Within hours of the JFK assassination, Lee Harvey Oswald was proclaimed as the lone gunman. The police and the FBI showed no interest in looking for any other suspects. Oswald, however, repeatedly insisted that he had killed no–one, and that he was “just a patsy”. Two days after President Kennedy had been shot dead in Dealey Plaza, Oswald was himself shot dead in the basement of the central Dallas police station. Oswald’s killer, Jack Ruby, was quickly discovered to have connections to organised crime, and appeared to have stalked Oswald during the two days in which Oswald was held in custody. Oswald’s murder inevitably generated suspicions that he had been eliminated either to prevent a weak case coming to court or to stop him disclosing inconvenient facts, such as the identities of any co–conspirators he may have had. Is There Evidence of a Cover–Up? The Dallas police, the District Attorney, the FBI and the Warren Commission consistently used the broadcast and print media to proclaim Oswald’s guilt. For an account by one of the earliest critics, see Mark Lane, Oswald Innocent? A Lawyer’s Brief . Bertrand Russell, writing just before the publication of the Warren Report , also noted the collusion between the press and the Warren Commission. Russell claimed that the Commission misrepresented witnesses such as Robert Oswald, the supposed assassin’s brother, and publicised false evidence of Lee Oswald’s guilt. Bertrand Russell and other early commentators drew the obvious conclusion, that the Warren Commission had not been concerned with finding out the truth of the assassination. Oswald’s marksmanship was clearly much worse than it needed to be for a lone gunman to score two hits out of three with an inaccurate and unreliable rifle. If Oswald alone was involved, he must have taken the rifle into the Texas School Book Depository on the morning of the assassination. Only three people saw him before or during his arrival at work; all three were adamant that he had not carried a rifle. Howard Brennan, the only witness to give a detailed description of Oswald in the sixth–floor window of the TSBD, was far less credible than the Warren Report claimed him to be. Carolyn Arnold saw Oswald on either the first or second floor of the TSBD at the same time as another witness, Arnold Rowland, saw a gunman on the sixth floor. The Commission dismissed Rowland’s evidence on spurious grounds, and ignored Carolyn Arnold completely. Far more witnesses heard shots from the grassy knoll than were acknowledged by the Warren Report . Dr Malcolm Perry, who stated clearly in a press conference at Parkland Hospital that President Kennedy’s throat wound was the result of a shot from in front, was deceitfully persuaded to admit that he had said no such thing. Perry and the other doctors who had treated President Kennedy were put under pressure to admit, contrary to the evidence, that the single–bullet theory was plausible. Dr James Humes, the chief pathologist at President Kennedy’s autopsy, was adamant that there was an entrance wound low on the back of JFK’s head. This wound could only have been the result of a shot fired from the sixth floor of the TSBD if the president had been leaning very far forward at the instant of impact. The Warren Report included a drawing which duly showed Kennedy leaning forward at a suitable angle. The Report also included images from the Zapruder film, however, which showed that Kennedy had been sitting almost upright at the instant of impact, and which proved that the entrance wound could not have been caused by a bullet fired from the sixth floor. A great deal of information has become available since the publication of the Warren Report in September 1964 and the Hearings and Exhibits two months later. Much of it is the result of activity by the general public: in particular, the use of the Freedom of Information Act by independent researchers, and the lobbying campaigns that brought about both the House Select Committee on Assassinations in the late 1970s and the Assassination Records Review Board in the early 1990s. Both of these official bodies have released a large number of informative and previously secret documents into the public domain. Many of these documents, however, are still known only to informed researchers. The print and broadcast media have shown little interest even in reporting, let alone independently discovering, anything that might challenge the original official findings. Indeed, the media still take it as an article of faith that Oswald was guilty of the JFK assassination. Internal White House documents, including recordings and transcripts of presidential phone calls, reveal the process that led to the establishment of the Warren Commission. The transcripts of the Warren Commission’s executive sessions demonstrate the Commission’s almost complete lack of interest in any solution to the crime other than that Oswald was the lone assassin. Many of the Warren Commission’s memos and other internal documents illustrate the Commission’s dependence on the FBI as its main source of evidence. The Schweiker–Hart Report in the mid–1970s strongly criticised the FBI’s competence and objectivity in providing evidence for the Warren Commission. Internal White House documents make it clear that one event triggered the cover–up: the discovery, early on the day after the assassination, that Lee Harvey Oswald had been impersonated in Mexico City a few weeks before the assassination. Oswald appears to have visited Mexico City in late September 1963. He appears to have visited the Soviet and Cuban diplomatic compounds in person and to have contacted them by telephone, with the intention of obtaining a visa to visit Cuba. One of the people he contacted was a Soviet diplomat suspected by the CIA of being attached to the KGB’s assassinations department. A man calling himself Lee Harvey Oswald was photographed going into and out of the Soviet Embassy. His telephone calls were intercepted, recorded and transcribed. Photographs and recordings were sent to the FBI in Dallas early on the morning of 23 November. We have up here the tape and the photograph of the man who was at the Soviet Embassy, using Oswald’s name. That picture and the tape do not correspond to this man’s voice, nor to his appearance. In other words, it appears that there is a second person who was at the Soviet Embassy down there. It is possible that Oswald did not actually visit Mexico City. There are no known photographs or recordings of his visit. At the time he was supposedly en route to Mexico, he was seen in Dallas by a Cuban émigrée, Silvia Odio, whom the Warren Commission and the HSCA considered credible. If Oswald had met officials from communist regimes, those regimes would be implicated in the JFK assassination. The impersonation of Oswald suggests that the apparent involvement of the Soviet and Cuban regimes in the assassination was a deliberate deception. or other conspirators, presumably political enemies of President Kennedy or the Soviets, had falsely implicated those regimes in the assassination. In the early 1960s, the notion of an international communist conspiracy was still widely believed. If Oswald were shown to have been acting on behalf of the Soviet or Cuban regimes, there would be public pressure for military retaliation. If the other theory were true, and Kennedy had been killed by political forces within the US, there was the risk that the general population would question the legitimacy of those nation–state institutions that worked to preserve the existing distribution of domestic power. The only safe solution to the crime required Oswald to have acted alone, and with no ideological motive. Within two days of Kennedy’s murder, an opportunity arose that allowed the authorities to limit the growing public distrust of political institutions. The murder of Oswald by Jack Ruby removed the possibility of a trial, at which evidence would be put forward and questioned. It was now possible for Oswald to be branded the lone assassin without substantial risk of contradiction. Although no serious criminal investigation had yet taken place, Oswald’s guilt could safely be assumed. President Johnson was advised that the media would play its part in promoting the lone–gunman solution. He used the suggestion of Soviet involvement in the assassination to persuade the very reluctant Earl Warren that the national interest would be served by his participation in what became the Warren Commission, which was formed a week after the assassination. Setting up the Warren Commission turned out to be a wise decision. The FBI Summary Report was embarrassingly poor: it devoted just one page to the details of the assassination, and it neglected to mention all of the wounds. There was no room for the FBI’s account in the Warren Commission’s twenty–six volumes of Hearings and Exhibits , although space was found for documents such as Jack Ruby’s mother’s dental records from 1938 ( Warren Commission Hearings , vol.22, p.395 [Commission Exhibit 1281]), which, as Mark Lane is supposed to have said, “wouldn’t be relevant even if Ruby had bitten Oswald to death”. The FBI report was instead placed in the National Archives, well out of the reach of the uninquisitive press. The Warren Report succeeded in its purpose. The Report was almost universally praised in the media, with the New York Times taking a prominent role. Several years later it become clear that the Warren Commission had misled not only the general public but also its own members. One commissioner, Senator Richard Russell, objected strongly to the single–bullet theory, and was deceived into thinking that his objections would be incorporated into the Report ; see Richard Russell and the Warren Report . It was the apparent possibility of Soviet involvement in the assassination that led to the prompt government decision to make Oswald the sole assassin. There is no reason to suppose that senior establishment figures such as Lyndon Johnson, J. Edgar Hoover and Earl Warren, all of whom actively participated in the cover–up, had any prior knowledge of the assassination itself. According to remarks they were reported to have made in later years, both Johnson and Warren genuinely believed that the Soviet or Cuban regimes were behind the murder of President Kennedy. The appearance of communist involvement in the JFK assassination was an essential part of the conspiracy, and was achieved substantially through the framing of Oswald in Mexico City. The plan relied on the understanding that influential Washington insiders would work to preserve public trust in established political institutions. The strong links to intelligence organisations throughout Lee Harvey Oswald’s career appear to have served two purposes in the assassination plot. Oswald’s defection to the Soviet Union in 1959, as well as his incriminating activities in New Orleans in the summer of 1963, and perhaps in Mexico City, served to mark him as a communist sympathiser. Rumours that Oswald had been an FBI informer or agent encouraged the FBI to play their part in promoting the lone–assassin hypothesis. Institutional reasons are sufficient to explain the cover–up. The fact that the predictable workings of government institutions were incorporated into the conspiracy suggests very strongly that the plot originated somewhere within those institutions.